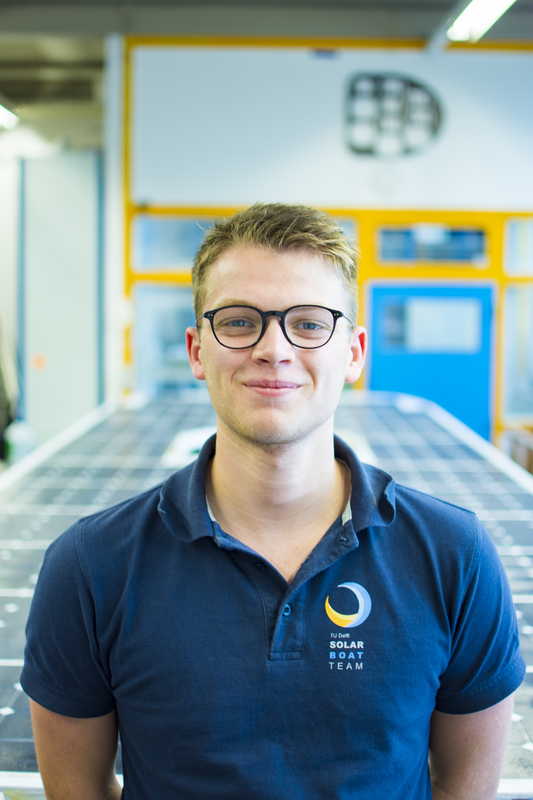 I'm a second year Aerospace Engineering student at the TU Delft, and I joined The Solar Boat Team because I wanted to do something with all the stuff I learned in my first year. The concept for this year, a boat that only goes offshore, was also something that really intrigued me because it is something totally new from the past years. The fact that the boat is 100% powered on solar energy was also a big influence on why I wanted to join the team. I think the marine industry is by far the most behind on renewable energy and now we can show them how it's done. Because I work part time this year my biggest personal goal is to improve in time management. Combining my study and the solar boat team is something that will be tough and can only be done with good planning. Another one is of course to win the race in Monaco and make an amazing boat. I'm part of the vehicle dynamics department, which means that we are responsible for the dynamics and stability of the boat. Personally I'm responsible for the strut and the wing of the boat. This is something I do with Max and it is perfectly in line with my study (Aerospace Engineering).